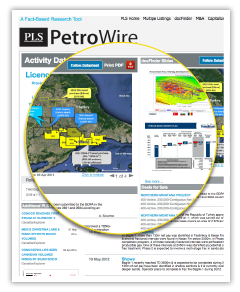 PetroWire is an advanced project-tracking database, developed in conjunction with a major oil & gas company, that monitors activity across the global oil and gas value chain. 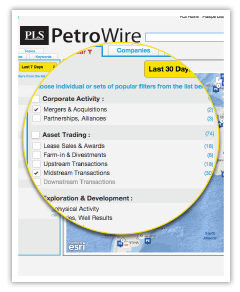 PetroWire is the perfect tool for busy executives seeking quick market intelligence on oil and gas activities and projects. This unique database can be used to follow operations in a group of countries; monitor the activity of a peer or competitor; identify service or industry projects; and detect business opportunities. Clients can receive effective business activity indicators or scouting information such as: tenders for licenses, permit awards, plans for geophysical work, plans to drill, plans to build, contract awards, M&A news, joint ventures, alliances and partnerships. Check industry or project activity with incremental information from the last 7 days or more presented by country or information type. Create/modify personal filters by combining countries, types of activities, companies and type of information, etc. and receive the corresponding information by email alerts. Search the global database which contains almost 500,000 fact abstracts and over 51,000 project activities. Industry activity, reports and IR materials are exhaustively processed by PLS analysts who identify incremental information and author short, tightly focused Abstracts. Information abstracts are compiled in Activity Data Sheets with maps, general information and historical archives dating back to 1998. These can be exported as PDFs and shared with colleagues. Clients can filter the abstracts to their criteria, customizing reports that can be exported as a PDF. Regular reports can also be received hourly, daily or weekly as mobile-friendly email alerts. 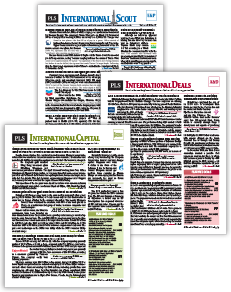 Stay informed on global news, analysis and business opportunities with PLS' international reports. Subscribe by bundled package or pick the report that best suits your needs. PLS processes information within 24 - 48 hours. PetroWire has continuously tracked O&G activity since 1998, rationalizing a growing mass of company information and published reports. Documents & press reports are analyzed in entirety with no editorial bias. 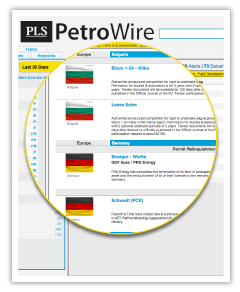 PetroWire provides unparalleled breadth and depth of coverage on worldwide O&G activity. Information is broken down into concise abstracts categorized by type of event (permit award, plan to drill, discovery, plan to build, etc.). Clients can filter abstracts to personalized criteria (including by project, country, company, topic, keyword, time, etc.) and build customized reports that can be delivered at a time and in a format of their choice. The information abstracts produced since 1998 show valuable project history and progression, organized in a relational web database. The information can be accessed and retrieved from any web browser connected to the internet.